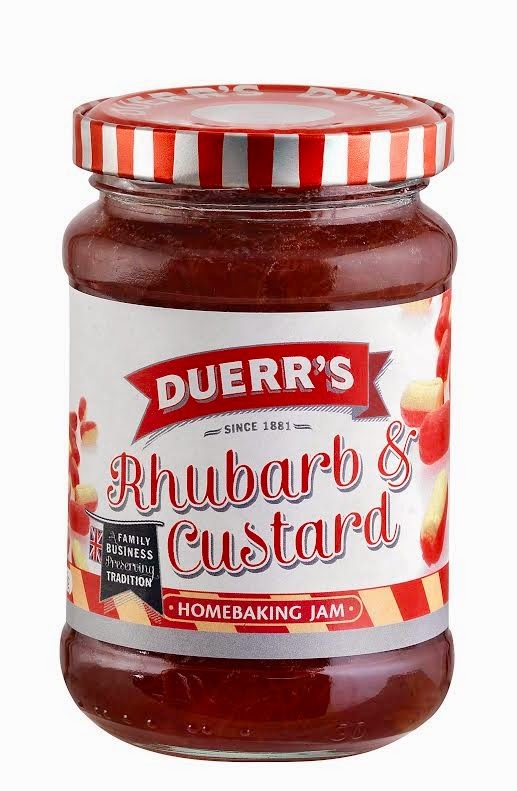 Do you remember I was recently sent some of Duerr’s Rhubarb and Custard Home baking Jam to try? It’s a bake-stable jam which holds it’s consistency when baked. It has great flavour, just like those rhubarb and custard sweets. I thought the flavour would be lovely in sticky buns, a bit like I made a couple of years ago with some Dundee marmalade. It’s a recipe for a soft yeast dough, which is spread with some of the jam, sprinkled with some brown sugar and some chopped nuts on top of that. This is then rolled up like a swiss roll, before being cut into the buns. Baked, then topped with a sweet icing, this recipe is a perfect way to use your Duerr’s Rhubarb and Custard jam. For the nuts here, I chose cashews as they are quite creamy in flavour and compliment the custard flavour part of the jam. The buns are light and fluffy, with a sticky jam centre, and a lovely sweet icing to compliment things. You are going to love these!! Heat the milk in a saucepan or microwave to no more than 40C. Remove from the heat and sprinkle the yeast on top, and a pinch of the granulated sugar. Leave it to activate for about 5 minutes. In a bowl, mix together the cooled, melted butter, egg yolk and vanilla. Add this mix to the yeast and blend together. In a separate bowl, whisk together the flour and salt, making a well in the centre. Add the wet ingredients and stir until a dough forms. Transfer the dough to a floured work surface and knead for 6 minutes. Place in a lightly greased bowl and cover with clingfilm. Leave the bowl in a warm spot and let it prove for 1 ½ hours. After this time, knead again for a couple of minutes and return to the bowl, but cover directly with a piece of greased clingfilm. Cover the bowl too. Chill in the fridge for at least 4 hours, or overnight is fine too. Take the dough and roll out on a floured work surface to a rectangle apporoximately 10”x18” in size. Spread the soft butter all over this, except for one inch at one of the long ends. Then spread the jam over this, top with the cashews and brown sugar. Roll the dough from the long end with the filling and roll tightly until you get to the end with no filling. Wet with water and pinch to seal the ‘log’. With a sharp knife, cut the log into 8 equal pieces and place each piece with the swirl upwards, into a buttered 9”x9” baking pan. Cover with clingfilm and let rise for another hour. Preheat your oven to 180C. The rolls will begin to touch one another which is fine. Place into the oven for 20 to 25 minutes or until they turn golden brown. Cool them in the pan for 10 minutes before removing. In a bowl whisk together the melted butter, icing sugar and vanilla. Loosen the mix with a teaspoon or two of milk until you get a thick but dropping consistency. Pour over all of the buns. 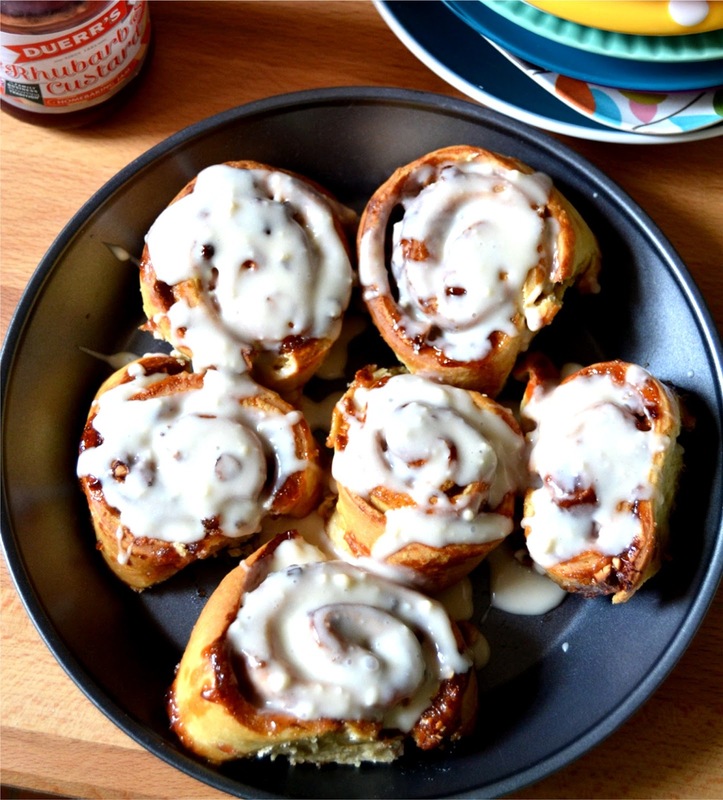 Allow the icing to set before you tuck in. Disclosure Statement: I received the jam free to try. I was not asked to provide a recipe and have not been paid for this post. oh my word I am in love with these.. stunning! Cheers Dom - tasty too! Oh my I just want to shove these in my face!! Ha ha, they are perfect for that! !